The contemporary Russian artist A. M. Shilov painted portraits of his daughter with great love. So it was tragic that daughter Masha passed away before her father. 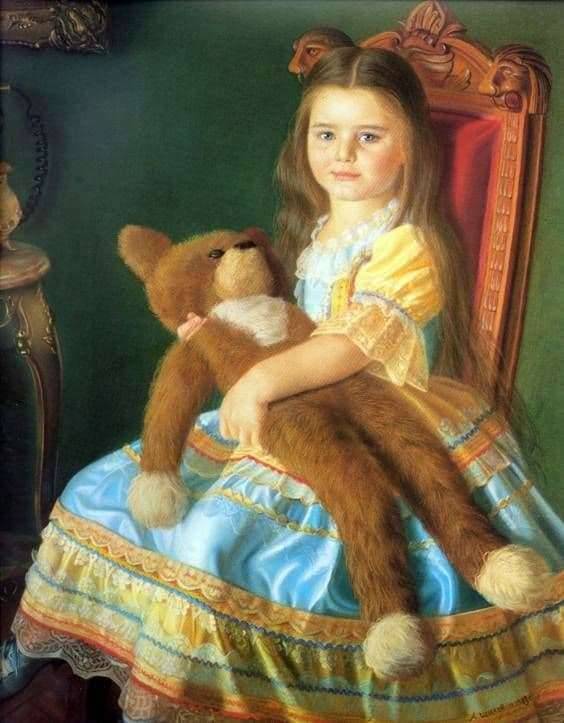 But as he wrote her from early childhood, he continued to paint portraits even after the death of his daughter, presenting her to be grown up and very beautiful. The tragedy happened when Masha Shilova was only 16 years old. The portrait “Masha Shilova” was created in 1983. Then the artist’s daughter was 4 years old. The picture turned out bright and joyful. Still nothing foreshadowed future unhappiness. Masha sits on a chair in a smart dress, holding a toy bear in her hands. With her plump little hands, she presses her furry friend to herself. With kindness and spontaneity, the girl directs her gaze directly to the viewer. Despite the very young age, Masha is clearly aware of her girlish appeal. Her posture is straight, proud. The regrown hair falls from the shoulders and shimmers in the light. Smart smiling face adorns a healthy glow. Blue eyes shine with joy. Alexander Shilov paid much attention to the surrounding interior. The back of a wooden chair is decorated with marvelous carved elements. In the field of view fall leg luxury table and a gilded picture frame. The backdrop is a green wall. Masha is dressed in an elegant dress of satin with lace. Everything in this portrait delights, attracts and pleases. Viewers can feel the parental warmth, care and sincere love with which Shilov wrote his daughter. The picture is written in pastel. Thanks to this unique technique, the colors on the canvas are gently shimmering, giving it a striking realism. A beautiful creature looks at us from the portrait – the pure soul of a happy child. The painting “Masha Shilova” is in the artist’s personal gallery, next to the Kremlin.